When I started out with cattle, everything I knew about them was written on a check for $11,400 that I wrote for nine cows and five calves. That was in 2005 and I guess I’ve learned a few things about bovines since then. One of these things is how tough and resilient they are to foul weather. 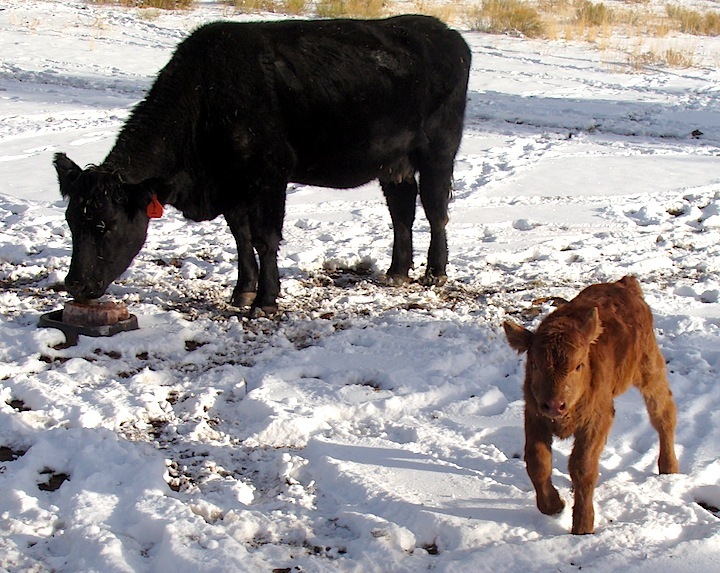 Take, for instance, the surprise calf that was born the night before last when it was about 14 degrees below zero. I wouldn’t normally plan for our cows to calve this early, and this one actually arrived a bit early — I was expecting a February calf. Many ranchers do start calving in January and I’ve seen other early calves in pastures in recent days. I spoke with a veterinarian about this and he said they can handle extremely cold temperatures just fine so long as there’s no wind or blowing snow. The mother cow licks the calf dry and gets it to nurse warm milk quickly. But the real question is, why do cows often seem to wait for bad weather conditions — like extreme cold or a snowstorm — to have a calf? Some say it has to do with barometer changes. That may be the case. But why? I’ve begun to wonder if there’s some evolutionary component to this. Perhaps over time cows became genetically programmed to have calves during foul weather because predators move around less in these conditions. Or perhaps there’s some other reason we can’t fathom. In the past years we’ve had a few calves born in bad conditions — actually a wet snowstorm in March or April scares me more than dry cold in January — and they all seem to do just fine. Perhaps we humans apply too much of our own sensibilities to these situations when in fact Mother Nature has it all under control. When I checked on the cattle at dusk this evening the new calf was running in circles around the big cows. It was a balmy 18 degrees. This entry was posted on January 12, 2011 at 10:35 pm and is filed under Ranching. You can follow any responses to this entry through the RSS 2.0 feed. You can leave a response, or trackback from your own site. I hate to say it but I don’t think cows calve in bad weather to avoid predators. Rather I think we humans actually screw up their options by breeding so early. You don’t see the wild ungulates having their offspring in a January or March snow storm. They are the ones with the survival genetics to wait until June when the grass is up giving them high quality food sources and less stress on their calves and fawns. We had originally planned our calves for spring. But things happen, and the next thing you know you have two cows having winter calves. That said, wild ungulates have certain natural breeding times resulting in spring offspring. Domesticated cattle cycle and breed year-round. We have the same problems with horses – not the smartest of survival techniques. Many years ago friends bought a mare from out-of-state and asked to board it here since we have a barn and all. One below-zero wind-swept morning I woke up to a black foal standing next to the mare in the corral. It lived. On the other hand, I let a jack run for many months with a mare here and we had a beautiful mule foal on a warm day in late May.